It’s an exciting time for new access technologies like balloons, drones, and solar-powered airships that garner considerable media attention. Meanwhile, affordable, quality solutions available now already prove themselves in deployments connecting hundreds of thousands of hotspots around the world. This technique applies when the community is small (less than 1 mile in diameter), and has a centrally located tower or high-rise building about 2 stories taller than surrounding structures. In this scenario, rather than installing several Wi-Fi Access Points (AP) and losing the spectrum in backhauling the traffic from their various positions, three dual-band Wi-Fi APs with 120 degree sector antennas can be mounted on the tall central structure. The three APs should each use different, non-overlapping channels (only three non-overlapping channels exist in 2.4 GHz). For this type of deployment, 21 dBm transmit power and 15 dBi antenna gain would give optimum results (assuming that the EIRP limits are around 36 dBm, which is true of most regions). In general, always select lower transmit power and higher gain antennas due to the very low transmit power of the connecting devices. This strategy applies to larger communities (spanning around 2-7 miles). In this case, a tower, high-rise building, or hill can be used to deploy a cluster of Point-to-Multipoint APs. This PMP AP cluster wirelessly connects to various subscriber modules (SM) in the community to supply Wi-Fi hotspots. One management system (controller) should manage both the PMP system and Wi-Fi APs. 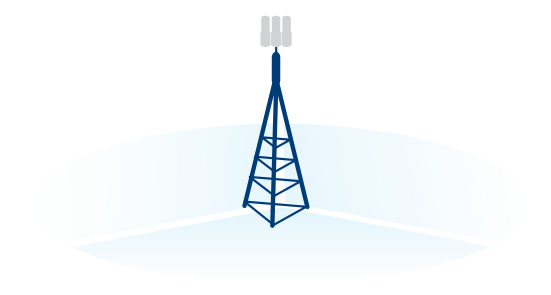 The PMP system should be TDMA to provide reliable and deterministic backhaul. The PMP system should be capable of high throughput (possibly using techniques like Massive MU-MIMO when the deployment will include more than thirty Wi-Fi hotspots). The Wi-Fi access point and the SM should both connect to one power source to simplify the deployment. This technique is ideal for deploying long-distance Wi-Fi along stretches of road, railway line, or beach. One management system (controller) should manage both the PTP system and Wi-Fi APs. The PTP system should be TDMA to provide reliable and deterministic backhaul. The PTP antenna should form a narrow beam to reduce interference and increase range. The PTP antennas should have good front to back ratio to avoid self-interference. Alternating links should use two different channels. City-wide W-iFi Mesh with multiple hops is a method with limited efficiency. These configurations can be vulnerable to external and self-interference, reducing throughput capacity with each hop. Wi-Fi mesh configurations can provide adequate performance conveniently in some cases. For instance, the mesh technique easily extends the primary coverage to other small areas without available wire, such as a restaurant patio. An extended deployment requires combining the above techniques, which compounds the importance of a centralized management system that deploys, manages and troubleshoots the equipment used in all the above scenarios. Cambium Networks’ cnPilot line offers the best and most flexible options for rapid outdoor deployment. The cnPilot E500 Outdoor Omni and the cnPilot E501S Outdoor Sector together offer ample options to maximize coverage and capacity requirements. The E501S, in particular, offers the powerful combination of high antenna gain (10.5 dBi on 2.4 GHz and 13 dBi on 5 GHz) and a high front-to-back ratio, providing both range and capacity. For example, mounting two adjacent E501S units can double the capacity (512 users) in a 240° arc. Both the E501S and the E500 have an auxiliary PoE out port that allows them to supply power to devices such as an 802.3af module, or Cambium’s ePMP or PMP 450 backhaul radios. This unique feature enables effortless outdoor Wi-Fi deployments with optimal AP location relative to clients and wireless backhaul of traffic to the Wi-Fi AP. Finally, Cambium Networks’ cnMaestro management system supports both the Wi-Fi APs and Cambium’s wireless backhaul. One controller management ensures that these deployments are simple to operate, efficient to maintain, and easy to troubleshoot.